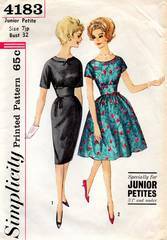 Pattern is specially sized for Junior Petites 5'1" and under. Dress features fitted midriff sections, kimono sleeves and back zipper closing. Optional shaped yoke at neck. Short or elbow length sleeves. Slim skirt with back kick pleat or full gathered skirt. Back Length - neck base to waist - 14.5". Finished back length of dress - 38". Cut and complete. Envelope and contents are in good condition.